In all the years I have lived and worked in Northern Italy, I have never traveled south of Sorrento. In April 2009 was the first time I went to Sicily, and immediately fell in love with it. It felt so comfortable to be there, as if I finally found my home. I said to myself, in all the years I have been in Italy, why did I not make it to Sicily? Like anything, when the time is right, it will present itself. Perhaps the comfort and grounding I felt is due in part that my grandmother is from Reggio Calabria, which neighbors Sicily. During my April 2009 visit, I discovered Caltabellotta, a breathtaking town, comprised of a cluster of homes cascading like a waterfall down from the crest of the mountain. Caltabellotta is 30 minutes from the southern coast, and 1 1/2 hours South East of Palermo. There was one particular property which is for sale, an old church ( San Paolo ), which was abandoned and in the 1950’s used for a few years to store grain and produce bread. Most of the interior details were plastered and cemented over and a few of the exterior walls were also covered over. The original entrance along with all the windows were also covered up. It will take 3-6 months alone to carefully remove all the interior cement and plaster to expose the original stone construction. San Paolo is a stone and plaster construction. There was never any ornate interior detailing, so to remove the plaster and expose the original stone construction, will be beautiful. 75% of the original vaulted ceiling remains. The creation of this Center for Inspiration is important to me on two levels: 1) being thrown a slight curve by nature and understanding I have an opportunity to truly give back and inspire, and b) I have had an extraordinary creative career, and my Dream is to create a location where creativity and inspiration will flourish. Summer workshops for the months of July and August, with the remaining months for professionals and professors in art, design, architecture and the creative arts, along with supporters of this foundation. This Center for Inspiration will also be utilized for cultural events. The students experience will be genuine. There is nothing pretentious about Caltabellotta. Caltabellotta and Sicily immediately embraces you and makes you feel at ease. When at ease, excellence is possible. In Caltabellotta, there are no distractions. What is uniquely special is the cloistered nature of the experience, where students are more or less living side by side with renowned designers, professors and faculty. Students will be immersed and rubbing shoulders with excellence. This Center for Inspiration is located on a mountain top, with unobstructed views of the valley and coast. Inspirational by itself, but being immersed in all the creative energy and experience, each student will absorb and utilize throughout their entire creative life. I strongly believe in the diversity of the students from different backgrounds and countries, is one of the most meaningful advantage to creative education. Students work together in multidisciplinary project groups. These collaborations are dynamic and promote an inspiring exchange of cultures, ideas, and solutions. As a student they will not only learn from their professors, projects, but also from their classmates. Working as a community as a whole, each student will discover the value of both individual and collective input, and that communal development is very rewarding. It is all about shared interests, creative interaction, and valuable personal exchange. Students will continually be mentored by international renowned professionals and professors throughout the entire design process. There will be a constant and fluid dialogue with each student and the group as a whole, to ensure each students progress. This is a very special educational experience for all students. There will be an inspiring creative intensity, as the students, professionals and professors will be living and working side by side. There are no distractions. Everyone is more or less on a mountain, together, focused. A typical day may have 6 hours of classroom, but free time and cultural visits are essential, in order to receive the true experience. Neighboring towns, such as Sciacca, and especially Palermo, not to mention any of the spectacular Greek colony ruins, such as Agrigento, or Segesta, are inspiring excursions. 15 -20 students is ideal for enough dynamics to happen, without too many subgroups forming. During the Orientation period ( which may be 2-3 days ), Domus Academy alumni would be present, and side by side with the students open, informal conversation can take place, especially during a fabulous meal together. It is this informal interaction which is important, where the students immediately experience the immersion. The students will experience the passion, energy, and wonderful design experiences of the alumni. The students would be inspired to see how enriching being a designer truly is. A few days of orientation is important, where students get to know each other, through sharing experiences, passions, what inspires them. Cultural visits: trips to two of the most preserved ancient Greek colonies, Agrigento and/or Segesta, also a daily visit to Palermo and to Caltabellotta’s neighboring town, Sciacca. Discussions of design, art, and culture on a local and international level. Group Brainstorming / ideation ( A good, open, brainstorming will not only loosen the students, but give them confidence within the group. The students will get a sense on how each of them thinks, especially their individual strengths. Each of us is an individual, with different points of views, with different ways of addressing, identifying, and solving a problem. Sicily offers an informal environment for open dialogue, and exchange of inspirations and ideas. We as individuals are in constant flux, just as the world as a whole. It is up to us to see and interpret stimuli. Every aspect of our planet is a combination of individuality, and disciplines. We must be able to recognize our unique “gift” and no matter how seemingly small our individual contribution may seem, how it compliments other individual contributions, to be able to work together as a whole. It s all about collectivity. Design is a combination of historical, present and future considerations. Each of us is an individual, with a unique “gift”, a unique way of thinking, seeing and interpreting every detail around us. In a single day of our lives we are able to see and interpret countless stimuli, which as designers the result should be the inspiration for several ideas. These ideas may simply remain in the conceptual stage, and never make it to production, but conceptual thinking is critical. We cannot see design as a means for another product to arrive on in the marketplace, but on a much greater level – the process of thinking and developing an initial idea, no matter where it takes us. Manufacturing has its limitations, in the sense of what materials are available at this moment in time, but this should not be limiting to open thinking to what will be available and possible in the future. It is up to us to think about the past, present and especially what the futures holds for us. The future is in our hands, and it is a great responsibility. Lets embrace the challenge and enjoy every second of creative thinking, and the process of getting there. The courtship/development along the way, should be the most gratifying, because it involves inspiration and learning. The emphasis is on the design process, and the challenges it produces. Design is not simply design, but more importantly communication. Exactly what is the design communicating? On what level? And to whom? Ultimately, should the design solve a problem, or is its existence merely conceptual, to provoke thought, which in itself is an important catalyst for others to be inspired and move forward with. What is affordable? Not in the sense of a dollar figure, but where we should invest our time and energy, and for how long? To compliment the design process, relaxation is critical. Dinners will be created by various individuals from Caltabellotta, along with invited chefs. After a wonderful day of design it is a bonus to experience and be part of not just the preparation of a wonderful meal, but in its enjoyment. Sitting, eating, conversing of the day is a beautiful way to unwind. It is important to understand the balance of concentrated focus on design, and when to set it aside. It is very important in the Italian culture to know when to set things aside and join together in a wonderful meal. There is nothing hurried or anxious about it. This is absolutely true in Sicily. All of Sicilys’ ingredients are genuine. I am not only referring to what is needed to prepare a wonderful meal, but the Sicilians’, their culture. Sicily has its own pace, which is very relaxed, and never rushed. On every level you can imagine, Sicily is relaxing, condusive to thinking, reflection and conversing. Perhaps a single Summer workshop for the duration for both months, July and August. There can be ( 2 ) two week workshops for the month of July, and ( 1 ) four week workshop for the month of August. 12-20 per workshop, and of course would be more depending on the number of students whom continue in more than one workshop. Apartment for Larry Laske, whom will live on site for atleast 6 months/year to manage building and daily activities. Caltabellotta has many abandoned houses, mostly two story houses, which can be purchased and restored quite inexpensively. This would immerse ( especially ) students, in the heart of the culture, with the local residents. No car or transportation is needed, as everyone in Caltabellotta walks through their beautiful narrow streets. There will be a grand communal kitchen in the center itself. All meals are provided. Coffee, juice and simple pastries will be available in the morning, and a lunch and dinner will be prepared, for students, faculty and any visitors. Transportation to and from Caltabellotta will be provided. The airport in Palermo, which is apr. 2 hours by bus, and 1 1/2 hour by car. Every second is breathtaking, as you travel through the Sicilian countryside. A specific designer can be invited, and which the designer sets a workshop proposal. I personally have had experience in small European offices, IDEO, and large corporations such as Steelcase, and Haworth, along with independent design for Knoll, and Ingo Maurer. I have also spent the past 10+ years as a consultant and product developer, enjoying every aspect from the initial sketch to finding the financing, engineering, prototyping, tooling, and selling the finish product. I understand the role of the designer working for someone else, and as an entrepreneur. I understand the somewhat pretentious “high” design which students seem to be chasing in order to get that glossy photo in the design magazines, but I also understand the constraints when designing and manufacturing a “mass” product. All levels of design are important for an inspiring conversation, as are the different aspects of every culture. I understand linear vs non-linear, conceptual vs practical, corporate vs non-corporate, at at times I wonder if I have traveled through my design career on pure intuition, and innate abilities. I do not feel I have ever taken any risks, because if I thought it was possible, then there is no risk. The risk is not doing anything at all. What is most important is what truly inspires each individual student? What I have enjoyed most about teaching, is not thinking of the word “teaching” but rather seeing myself as a facilitator. My role is not to produce another one of me, but to recognize each students individual “gift”, and nurture it as best I can. I can give direction, but not overwhelm. The student needs to absorb at their own individual pace, and as a result, they will learn. Mentoring is the key. The initial few months ( call it a several month orientation ): involved guests lectures ( such as the great Pierre Restany ), and group seminars ( as when I was a student in 1986 we had several 2 week seminars with: Michele De Lucchi, Philippe Starck, Paolo Deganello, Franceso Binfare. Dennis Santachiara. Each had a different project which we designer for, and all were very fulfilling. We were designing side by side with the “maestri”, and as students! That is the Domus Academy trademark. Then we broke off into groups for continued design projects. The last three months comprised our Masters project. Students picked whom they wanted to design their Masters for. In 1986, the Masters groups instructors were: Andrea Branzi, Francesco Binfare, Rodolfo Bonetto, and Geatano Pesce. My Masters was under Andrea Branzi. Just before Domus Academy, I was turned onto “La Casa Calda” ( The Hot house ) written by Andrea Branzi. Here I was, studying under, not only the director and one of the founders of Domus Academy, but God himself. 1) Perhaps the workshop is for 4 weeks, and ( 1 ) is offered for the month of July, and another for the month of August. The first 2 weeks is a workshop with the invited designer whom has a set workshop proposal, and the second 2 weeks is a workshop with me. I can perhaps has a set proposal, but would enjoy asking what inspires the students, and let them collectively set the workshop project. This may seem risky, but this will empower the students. I would not propose this if I was not absolutely confident of my skills and experience. I have designed many diverse products, and understand very well, both the conceptual and practicality of design. 2) Perhaps ( I would like to facilitate ) a 2 week course in furniture design, where no laptops are used, the emphasis being solely on sketching. The focus will be on designing a chair: a) it is something we can imagine physically using, so it involves not just aesthetics but ergonomics, and b) it is small enough scale that the final deliverable will be a full scale, pencil / pen rendering of the chair design. I think it is important for the students to abandon the computer at critical moments in their design career, so why not as a student, whom may seem to relay on it. There is so much to gain when designing by hand, the physical act / connection to the idea / product, which sometimes cannot be felt through the computer. The computer is a great tool, but we cannot loose sight of the power and beauty of sketching / drawing. I am known for my sketching ability, and the clear communication of the actual sketch. I taught ( facilitated ) a furniture design course at Pratt, and both I am my students loved this 2 week course. Some struggled and were frustrated at first, because they were used to relying on their computers, but they came around and understood the pleasure of sketching and its use as an important communication tool. 3) Perhaps for a 4 week workshop: Does a visiting design professional/professor arrive with a set proposal for all students to follow, or can each student choose a subject which truly inspires them ?. I am sure it will be much more fulfilling to them to pursue something which inspires them. I would be present as an instructor ( as I will be living in Caltabellotta ), and there can be an invited professional as a second instructor. I do not think it will be confusing for students to have two instructors, but only beneficial. Perhaps the group of students is divided, so one half works under one instructor for the first ½ of the workshop, and then for the second ½ of the workshop, the students switch instructors. I think it will be refreshing for the students to possibly receive two different inputs, and it is up to the student to absorb the direction of both, and to decide how they want to move forward, trusting their own instinct, and making a decision to what the final design will be, just as they will have to do in the real world. I do believe that I, and any gifted designer can mentor any project which the students collectively pick as the project they would like to design. We, as professionals can also learn along with the students, which empowers the students. This would truly be a collective effort on everyones’ part. 4) The Masters thesis for the group I was instructing in 2003 at Domus Academy, was in ways historical. The theme was Benessere ( wellbeing ). I have designed my share of furniture, lighting, objects, and technology based product, but I was not interested in designing another chair, purse or object, which we assume will bring us pleasure ( Benessere ) but thought that with all the international diversity of the students, their diverse cultures and beliefs, it would be interesting to design for “Benessere in the afterlife”, addressing the much larger picture of what happens to us after death. What do we actually want done with our bodies to ensure our true future wellbeing? Just what is physical and spiritual? My student group was divided into three separate groups, and each designed a different form for burial, and what we actually wanted with our bodies after we were dead. Are we actually forgotten? How do we possibly lived on after death? It came down to trying to define the word, death, and what it meant to each of us. Every day their was excitement with every one of my students. I printed a book of the entire Masters project, from sketches to final presentation, which I would love to present to you. I would love to facilitate a workshop with this subject. I think it would be much more powerful not to disclose this to the students prior to their arrival, but to deliver it as a workshop possibility. At that moment of their first hearing of the subject, I want to hear their excitement, just like back in 2003. 5) Perhaps all work done at this Center for Inspiration will be in sketch form. No computer renderings at all ( also because perhaps in the initial years there will not be a printer for the students to utilize ). Perhaps the students receive ( 1 ) beautiful sketchbook, and it is in this sketchbook that they do all their work. Perhaps at the end of their stay, the ( original ) sketchbook is donated to the Center for Inspration, where it remains for both the archives and for future student inspiration. Ofcourse there will be a few scanners, for the students to utilize, so that they have record of their work. I personally think sketchbooks are extremely important, not just for the designing /thinking process, but as a journal. Work on a computer, on some chip, or remote hard drive just does not have a sense of existence for me. The actual sketch, the original full scale drawing, these exist to me. They are physical and real. Students will need heir laptops for communication in their personal life, and for research, but perhaps that is all. The below sketch and floor plan was my first proposal, having ( 4 ) three story apartments. This proposal was prior to my thoughts for educational usage. Please scroll through these sketches, and you will arrive at the educational usage proposal, which will also provide private apartments on the rooftop. Direct access to and from the kitchen and communal room to the outside terrace. Rooftop area for breathtaking views of Caltabellotta’s cascading houses. Ground floor: private living room ( furnished with antiques ), wood burning cast iron heater, bathroom / bathtub. Second floor: terrace accessed from the bedroom. The original vaulted ceiling and naïve will be open space, not just for visual pleasure but a functioning space. floor to ceiling fireplace: is a grand divider. It separates the naïve from the communal table area, while allowing traffic flow around the right or left. I cannot wait for the visual and physical warmth of a wood burning fire, in a large space with inspiring people gathered around the very large table, for a truly relaxing evening. communal table: There may be a specific time for breakfast, lunch and dinner, but the communal table is where at any time of the day, anyone can arrive to eat, drink, and share in conversation. kitchen: this space was added on to the church, so it provides a space for a grand kitchen. One wall is the original church entrance, allowing for an open visual and physical access between the kitchen and the interior of the church ( fireplace and communal table ), along with direct access to the outside terrace. Everyone will feel inspired to cook and congregate in this kitchen. A “professional” chef could be invited to run a cooking seminar, which all students, and those staying at the Center, can enjoy. Considering this location: breathtaking Caltabellotta and Sicily, I am sure that there will be many chefs whom would love to participate. outside terrace: anywhere on the terrace, everyone will enjoy breathtaking unobstructed views of the valley and coast ( which include orange and olive orchards ). There will be a long loggia, which under this loggia, you can take a break from the Sicilian mid day sun, and enjoy the breeze which arrives up the mountain from the coast. There will be a large underground storage room for: olive oil, wine, canned and jar foods, and general storage. machine / work shop: this space will have typical shop equipment such as: a standing band saw, cut off saw, welder, table saw, steel and wood work tables, grinders… The shop will be used to fabricate anything necessary for the building, but also for students, professionals, and any guests for general model making. gallery: on the second floor will be a gallery to display students and guests work. It is a presentation space / a celebration space. I would like all details to look as if they are fortified doors on a castle, inpregnatable. Solid wood with hand forged hardware. When the apartment is not in use, or the guests are away for the day, the solid wood doors are closed and locked. When the apartment is in use, the guests can keep the wood doors open, and have the glass doors closed, for a touch of privacy but not shutting out the rest of the space or guests whom might walk by, and look in for a private invitation to enter. The idea of this Inspiration Center is to provide the right amount of privacy and interaction. I would like all details to look as if they are fortified windows on a castle, inpregnatable. Solid wood with hand forged hardware. When the apartment is not in use, or the guests are away for the day, the shutters are closed and locked. When the apartment is in use, the guests can keep the shutters open, by placing a bar in place. A marble or granite frame. Perhaps a large Barouque mirror above the mantle? Perhaps an artist / /sculptor will design it, and carved of marble or stone. This fireplace is definitely a centerpiece to the interior space. I have designed a metal cart with wheels, to transport the wood from a back storage space, and then the entire cart is inserted into its holding niche. This is a clean and easy way of handling the firewood. Perhaps a very long aluminum extrusion will be hung over the table. In the underneath groove of the extrusion there can be several halogen or LED lights, which shine directly down onto the table surface. In the upper groove of the extrusion there can be candles, for indirect atmospheric lighting. I will invite Ingo Maurer to design a light for above the communal table. A one of a kind light by Ingo Maurer would be an amazing gift. Scroll up a few sketches to the ( Grand Space ) to see the communal table in proportion to the space. The apartments provide the right amount of privacy and interaction. This room will be accented with various antiques, and possibly a cast iron wood burning fireplace. a long credenza for material storage, and surface display. a freestanding bookcase ( possibly an antique ), otherwise all furniture will be in Austrian pine with cast bronze drawer pulls, consistent with the bedroom furnishings. Fabricated in Austria. In the each apartment, there will be a private bathroom, which will include: sink, toilet, and bathtub. This is a kitchen where everyone will love to cook, and learn to cook. It is a wonderful space to socialize during the entire meal preparation, with an open bottle or two of red. Guest chefs will love cooking for everyone. large counter top for preparation, cooking, and socializing ( personally, I love the entire cooking atmosphere, especially the preparation and the social interaction ). The floor ( which will extend to the outside terrace ) is a tile which is produced in a town neighboring Caltabellotta. It is wonderful at times to eat in the kitchen itself, especially if a small party of 2-4 people. A small table can be more intimate, verses the larger communal table. The dish wash station is isolated behind a freestanding wall, which keeps the unsightly dirty dishes, pans…out of view. I like this back stage idea. freestanding shelving for dishes, glasses, and drawers for flatware and utensils. The floor of the central church space extends into this room. The stone construction of the exterior of the church wall will be exposed. Entrance from interior of church. Soft dividers will allow for informal division of the work space. Perhaps a stairwell can / should be created to access the 2nd and 3rd floor. This would leave the church interior pristine. I personally like the fact that everyone walks on the walkways, especially to be up into the vaulting and within touch of the vaulting section construction. It all depends on the steepness of the stairs, from floor to floor. This is important to have, on the façade facing the cluster of homes. This façade location was the original church wall and entrance. It is a beautiful, pure reference to the history of the church, and what I felt when designing it. Poetically, this to me represents there are no barriers between the church and the outside world, or atleast there should not be. It is acceptance of both the light and the darkness which is accepted and allowed to freely pass through the subtle protective barrier, into the interior. The original wooden door may exist, but the entire original church entrance wall has been plastered over. The original wooden door may be behind and salvageable, but if not this sketch illustrates my idea for a door, approximately 4m x 2 m. I would like an old wooden door with a bronze cross, because of the contrast of materials, but perhaps a completely bronze door, which of course depends on cost. The cross is a symbol of the churches past, but also is a link to the present. I very much like the idea and poetry of the cross being the means for a door opening, allowing both sides to move through, as if between our life and heaven after death. The cross opens up and when it closes, everything which passing through it remains in it. The cross will probably only open up to the inside of the church. If comprised of two bronze sides, then the center may need a wooden core for strength. With no wooden core, a hallow core, the bronze door may have a very nice heavy empty sound the moment it closes shut. I have been in communication with the owners of San Paolo since my first post-op visit in August 2010. During a meeting in Caltabellotta, on July 23, 2012 a purchasing agreement was reached between the seller of San Paolo and the Foundation: a Brain Tumor and a Dream. 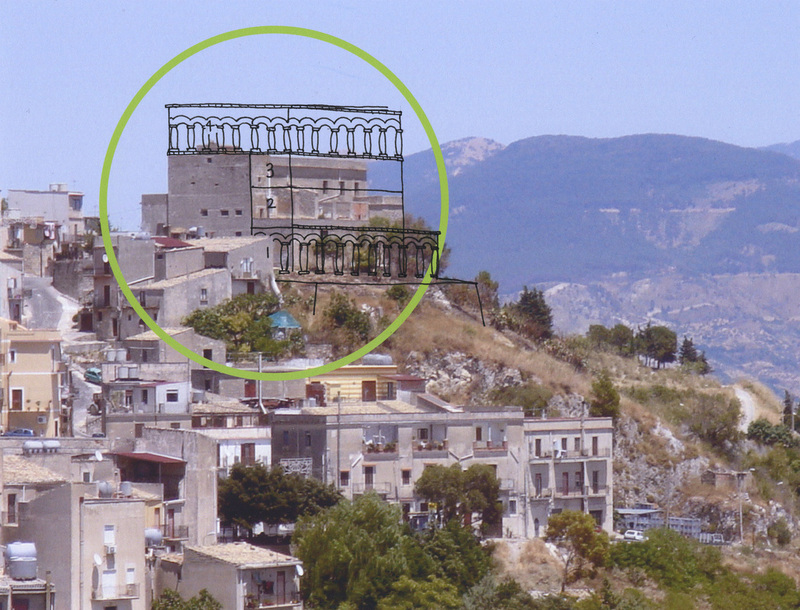 The Center for Inspiration is received with open arms, by the Mayor of Caltabellotta. The purchase price is 280,000 euro ( x 1.30 ) = 364,000 USD. The first payment of 100,000 USD, due on July 24, 2014. The balance, due on July 23, 2015. Then an estimation to the total cost for the restoration: 950,000 USD. Since 1986 I have lived and worked for many years in Italy. As an independent product designer / developer, I have engineered, prototyped, tooled, and manufacturing in Italy, as I am to this day. I am well versed in getting something Made in Italy. As a result of my many years in Italy, I have developed relationships with architects, manufactures, craftsmen. Many of whom will donate their time and energy in helping me with my project. One in particular is one of my dearest friends, Dante Donegani. Dante Donegani is a fellow 1986 Domus Academy classmate of mine. Dante was born in the Italian Dolomities and has lived, and worked in Italy his entire life. Dante is a very accomplished designer, professor, and many of his products are in the permanent collection of International museums. With all Dantes’ accomplishments, he is the most humble person I know, probably because he is a teddy bear of an Italian from The Dolomities, the Northern Italian Alps. There is nothing frantic or rushed about Dante. He carefully investigates and arrives at a wonderful solution. Dante has played a crucial role at Domus Academy since 1987, and for some 20 years ( and currently ) is the Director of the Masters program in Product Design. Dantes’ passion is both product design and architecture, and for the past few years he has purchased and restored several houses, two which are located in Velva, a small village which dots the mountain contour 20 minutes from Setre Levanti. Dante’s most recent restoration was published in the September/October 2010 issue of CASA TUA. Dante is well connected throughout Italy not only concerning the craftsmen to create the most beautiful hardware details, to the large scale architectural construction, but more importantly, he understands every detail in purchasing and developing property in Italy. Dantes’ sensitivity also shows in his watercolor for the house pub-lished in CASA TUA. 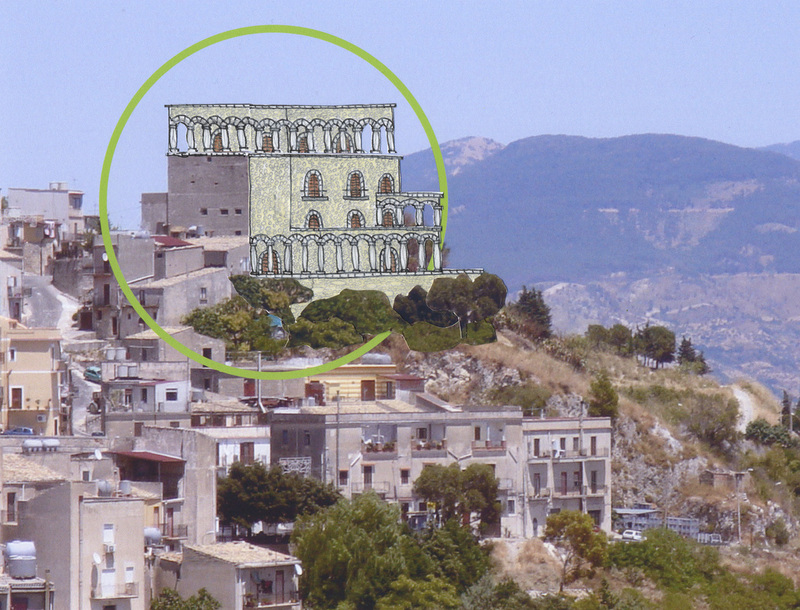 In July 2010 I spent a wonderful weekend with Dante in his Velva house, and we discussed the restoring of the ex church in Sicily. Dante mentioned that as an act of love and friendship, he will help me with every detail, especially all architectural services. He also wants to be a part of something meaningful, which will inspire others. I also know and have worked with several other architects in Italy, Austria and England. One in particular is born and raised in Sicily, and has lived and worked in Sicily his entire life. He is not just an architect, but he has a construction company which has fabricated everything from his furniture, interiors, houses and large office buildings. Many of Lawrence Laske's friends are professors, or Department Chairs at various International design schools and universities. Lawrence Laske can facilitate 2-4 week workshops, which would be a great opportunity to involve students in the design process of the Center for Inspiration. During these workshops Lawrence Laske would work closely with the professors and Department Chair at each design school and university. A TV show about “resurrecting” / restoring of San Paolo into the Center for inspiration. Not a tacky one like most of the reality shows, which are full of over-sensationalism, and over the top / non-believable characters, but one made by people that understand design and architecture. What triggered my thoughts was a reality show which Philippe Starck was involved with, a few years ago. Contestants on the show refurbished an old building in Paris, so why not an abandoned church in Sicily? The TV show will travel to 12 different International Design and Architecture Schools and Universities. 2 week workshops: Lawrence Laske would not disclose his project sketches or specific ideas, but would act as the client with some general ideas as design criteria. During the 2 weeks, students would have the opportunity to design the space and all its necessary functions. Lawrence Laske and a panel of professionals will be the final critique panel for each 2 week seminar. At the end of each 2 week workshops, a “winner” ( candidate ) will be selected to move forward to the final round. Perhaps the announcement of each institutions “selected candidate” is not announced, until all 12 workshops are completed. The 12 candidates can be referred to as, the 12 “design apostles”, as reference to the church, as this restoration project involves a church. All 12 will be flown to the actual site in Caltabellotta Sicily, to live on site for a final 2 week workshop, and at the end of the 2 week workshop, they will face their “final judgement”, a final critique panel, comprised of International designers, architects, and artists. It is important for students need to check their egos, and as developing professionals they need to understand that to truly be great, they must first understand humility. Students need to understand that they are not in school to become the next Frank Gehry, Calatrava, Jean Nouvel, or even Lord Norman Foster, but to understand their own individual creative gifts, and that they are at the very beginning of their creative career. They may become great contributors to the creative world, but the future can only fortell. Lawrence Laske has been communicating with a gallery in NYC and Chicago, which are also auction houses, whom are both interested in hosting a benefit auction. Lawrence Laske is well established in the International design community, and as a result is assembling a collection of sketches, drawings, paintings, prototypes, furniture, antiques, and objects, which are all donations. The collection will be exhibited and auctioned to benefit the Center for Inspiration. 4 ) The private and business sector will be contacted for various levels of financial contribution. Items to purchase directly from this website. Lawrence Laske has designed a simple, very beautiful logo, which not only represents the Foundation: a Brain Tumor and a Dream, but even without any words, the logo speaks for itself. When looking at an MRI, any white image is not good news. The inner white round shape represents a tumor, but also poetically represents a more vast universe where an object is in suspension, as if not sure where its place is in proximity to space and time. Is it coming or going? Will it get bigger or reduce in size? We are left with many questions with unclear answers. Items such as: t-shirts, pins, hats and wrist bands, can be offered for purchase. 7) Inviting PGA tour players to wear the logo. The more exposure = the more awareness. Lawrence Laske is organizing benefit dinners, during which raffle tickets can be purchased to win various donated items. Residencies (study/residence grants ) will be offered to designers, architects and artists, for a stay between 1-3 months. It is customary that atleast ( 1 ) major work is left behind ( donated ) to the foundation providing them the stay. The donated work becomes the property of the foundation, and at any moment may be sold to help fund the foundation. Personally, I think Josh Blue is a genius on every level. I would like to pitch an idea for a series of comics collectively performing at a few theatres. I would even be pleased with a one night, one time only benefit performance. See the list of comics I would like to contact, located in ( connections ) in the next section of this site ( donation / store / connections ). Hopefully, you will go to the next section donation / store and support a Brain Tumor and a Dream, by making a donation. I appreciate any level of your support.